The Only Absence Management System You'll Need! 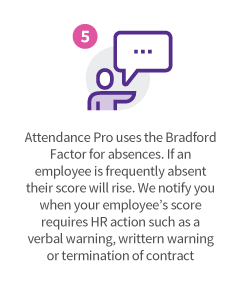 Our absence management system, Attendance Pro, was created to help businesses like yours reduce employee absence rates. However, it wasn’t just created with this intent, it’s been proven to reduce employee absence rates by as much as 60% for everyone using it. Imagine how more productive your staff, and your business, would be if you reduced staff absences by up to 60%! No more missed or rushed deadlines, no more having to cover other people’s workloads and reduced staff conflicts. Probably sounds too good to be true, right? Well with Attendance Pro, you’ll be reaping these benefits for your business in no time! It’s the only absence management system your business will ever need. Let us tell you why your business needs Attendance Pro. How Does Attendance Pro Actually Work? This absence management system works by tackling the root causes of absenteeism head on. Everything Attendance Pro does is all about making the software work as hard as possible for your business. To do this, our absence management system accurately records employee absence rates from day one! Sounds simple, I know but don’t take it’s simplicity for granted, Too many absence management platforms rely on unnecessary bells and whistles when they’re unable to competently deliver the cold hard data you require. 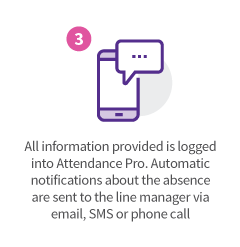 The on-boarding process for new users couldn’t be simpler and you’ll be able to start spotting absence trends within days of using Attendance Pro, allowing you to reclaim control over staff absence! What Does ‘Tracking Absences’ Actually Help Us Do? As a business, when you start accurately tracking staff absences, you’re taking the first step to combating the biggest issue you didn’t know existed. You’ll quickly begin to notice how damaging those one of sick days really are for your business. Taken out of context, the odd sick day here and there shouldn’t pose too much of an issue. But once you begin accurately tracking this information you’ll begin to notice the unpleasant truth. For companies with a high number of staff, your probably missing someone from at least one department every single day through illness. For companies with a small number of staff, you’ve probably still got people missing 2 or 3 days of the week. When you begin to analyse absence rates to this extent you’ll begin to see how much staff sickness is costing your business. And once, you’ve spotted this, you’ll begin spotting other trends. How often does Steve call in sick after payday? Why is Brenda usually sick on Mondays? How many people are regularly off the day after a big match? Once you’ve got this kind of information, you can start taking steps to address the issue. That’s the beauty of our absence management system, Attendance Pro. It WILL highlight this data to you. Sounds Good, But Is That All This Absence Management System Does? Attendance Pro is much more than just an absence management system. Attendance Pro is an entire HR solution to help resolve the issues you didn’t know you had. When you become an Attendance Pro user, you also gain access to 2 of our other core services. 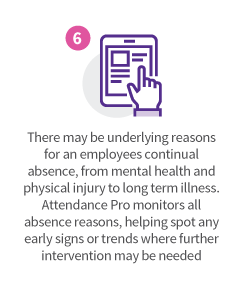 These work hand in hand with the Attendance Pro system to help you reduce your employee absence rates quickly and correctly. Unlike any other absence management system, Attendance Pro also gives you access to our team of employment law experts and our occupational health consultants. So how do these services work with this absence management system? Once you’re using this absence management system, within a few weeks you’ll start to spot trends quickly. So, what next? Call in the guilty parties and read them the riot act? Launch a full investigation and disciplinary process to get to the bottom of things? If you’re not used to proactively using an absence management system like Attendance Pro, then you might make the wrong decision. You might end up causing your business more harm than good. Because you’re an Attendance Pro user, you don’t have that issue. Once you’ve spotted an absence trend, you simply need to call our employment law experts. They’ll help you make the best and legally correct course of action. By following the advice of our employment law experts, you can rest assured you’re always making the correct decision for your business! Allowing you to accurately, effectively and legally reduce absenteeism! So you’ve spotted the trends and you’ve spoke to our legal experts but it’s still not helping? No problem, that’s where our occupational health consultants fit into this absence management system. Our occupational health team is filled with doctors, nurses and industry specialists. And every one of these are fully committed to helping you to get to the root cause of any potential health problems afflicting your work force. Have you got someone on a long term absence? We have a range of occupational health and health surveillance services ready and waiting to help them and you! Whatever the issue, our occupational health experts have the solution you need. And all of this is at your fingertips when you sign up with Attendance Pro. It really is the only absence management system your business will ever need! No catch. In fact, it’s not even expensive. You can get your business setup today on this revolutionary absence management system from just £2.50 per employee, per month! Still not convinced that Attendance Pro is the right fit for your business? Call our team on 08450 50 40 60 for a free consultation and to start reducing employee absence! Not got time to call? Complete the contact form and we’ll get back to you!